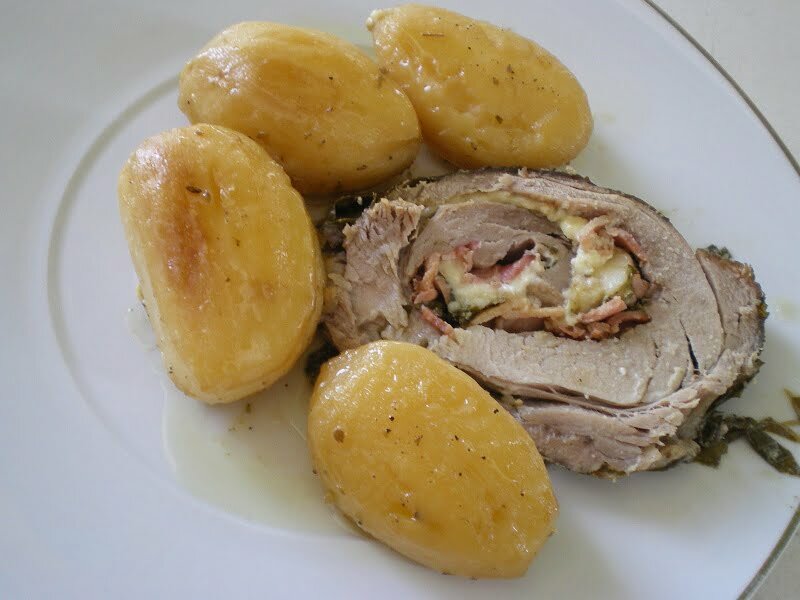 This Greek roasted pork is stuffed with bacon, halloumi, feta, as well as other ingredients then it is wrapped in vine leaves and baked in the oven with potatoes. Today is a public holiday as we are celebrating “Ochi” day. Ochi, means NO and this is what Greece’s prime minister, Ioannis Metaxas, replied on 28 October, 1940 to Mussolini’s ultimatum to allow Axis forces to enter Greece at the beginning of WW2. I invited my nephew and niece, who are students here in Athens to come celebrate with us. I prepared this lovely pork roast stuffed with bacon and haloumi, baked together with delicious lemony potatoes. What can I say about this dish except that if you like the ingredients you will be thrilled by the taste and it is a dish easy to make. You can serve it at buffets or on any special occasion and your guests will surely be thrilled. The roast, is very easy to prepare, cooks easily and presents well. The vine leaves impart a lovely, lemony flavour flavour to the meat. Vine leaves are usually used to make dolmades in Greece, but they are also use in other Greek recipes as well. If you do not have a vine from where to get them, in Greece they are sold fresh at the farmers’ market during spring or brined during the rest of the year. I am lucky to have a vine in our garden, so I collect them when tender, wash them, let them drain, label them to know how many in each packet and wrap them in a roll with cling film. I store them in the deep freezer and use them year round. You can also get them in supermarkets or various specialty shops, brined, in a jar. You will need to soak the brined leaves in cold water for an hour to remove any excess saltiness before using them. However, if you can’t find them, you can just use the parchment paper and then wrap it again in foil. You can make the same recipe with boneless lamb, goat or chicken. This Greek roasted pork is a twist to a classic dish made with lamb, which is perfect for any festive occasion. Various vegetables sautéed, such as mushrooms, onions, carrots, Brussels sprouts etc. Ask your butcher to cut the meat and to flatten it so that it may be stuffed and rolled. Sprinkle with salt, pepper and oregano. On a parchment paper lay the vine leave and place the meat on top of them. Sauté the bacon in a non-stick frying pan, without oil. Drain on kitchen paper. In a food processor blend the onion and the garlic with a few tablespoons of olive oil and add this on top of the meat. Place the bacon, halloumi cheese, feta cheese, some mustard and the parsley and mint on top of the meat. Then roll the meat and put a couple of toothpicks to secure, then wrap with the vine leaves and finally with the paper. In a baking tin place the potatoes. If they are small, pierce them with a knife and if they are bigger cut into big pieces, add salt, pepper, oregano, lemon juice, oil and water. Place the meat roll in the centre. Preheat the oven to 180 degrees C and bake until the potatoes are ready. Half way through turn the potatoes and add more water if necessary. When done remove the paper and the toothpicks. Allow to cool down before slicing. I love the whole concept of this dish Ivy…and that halloumi is just great as a stuffing. My hubby would instantly fall in love with this recipe. It looks really really good! Those photos do speak for themselves–this looks like a really delicious dinner! Also, I just wanted to let you know, your salt encrusted fish inspired me to finally try my hand at it last night and I’m very glad I did! I hope with all my heart that you are enjoying your vacation Sis. I have a small pork roast and some halloumi in the fridge and I am definietley trying this one!!!!!!!!!!!!!!!!!!!!!!!!!!!!! Wow this is impressive – I bet it tastes terrific too. Now, I prayed that my grape tree will grow faster with more leaves..LOL.